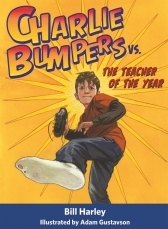 I learned that Charlie Bumpers likes black shoes more than white shoes. I learned the Charlie is going into the fourth grade he has an older brother Matt, a younger sister Mabel he calls squid ? WHY??? a dog Ginger and his best friend is Tommy and he dread getting Mrs Burke as his teacher for fourth grade . This should be a great read.. Thanks for the giveaway. When I visited the website I learned that Charlie admires Buck Meson the detective from Andromeda.